Last I checked, this anime seemed to be unavailable, though the CD soundtrack was available at Amazon.com. The above info came from Kaya_inu, and was edited by yours truly (contact me). The image came from Blue Laser. 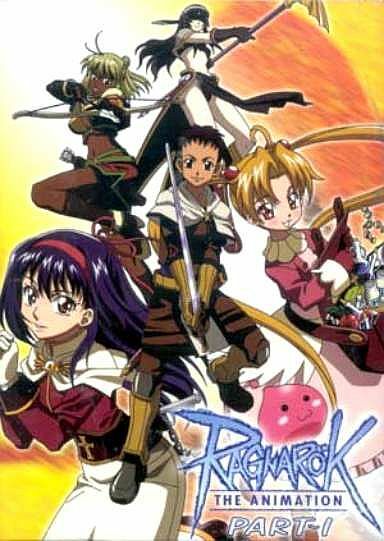 Ragnarok is an anime based on the Famous game "Ragnarok Online". The story begins in Midgard, in the city of Prontera at a cemetery. After Yuufa's brother Keogh's death, Yuufa is very sad but promises that she will not feel bad! Roan is her childhood friend who hangs around with her (and obviously likes her). Since he is a swordsman, he is much stronger then Yuufa, who is an Acolyte (healer), so he protects her. It's funny when someone asks "are you two lovers" and Yuufa says "No, we are just childhood friends", Roan gets disappointed. After they visit Keogh's grave, they come across an alley where a thief and a blacksmith are harassing a mage called Takius. Takius decides to join Roan and Yuufa on their journey. Along the way, they meet a cute little Merchant called Maya, though she prefers to be called Ma-chan. When they meet her in Geffen, the city of magic, she hangs around them. When they all get to Geffen tower, they encounter a bunch of Whisper's (ghosts/monsters). Roan and Takius aren't able to hit them with physical or magical attacks, and Ma-chan seems to abandon the group, but then comes back with a Flamberg (special sword) and hands it to Roan. After that, she decides to stay with them! Soon after, Roan, Yuufa, Takius, and Ma-chan meet one of Roan and Yuufa's friends, Irruga (an assassin) and a newcomer Judia (a hunter). Yuufa and Judia fight over Irruga at the beginning (note: Yuufa doesn't love him), but later they become friends! Through the series, Yuufa advances from an acolyte to a priest, and Roan to a crusader, and finally Takius becomes a Sage. But who is the mysterious person who looks like Keogh? Will they ever find out? Guess you'll just have to see it for yourselves. The above description came from Kaya_inu, and was edited by yours truly (contact me).